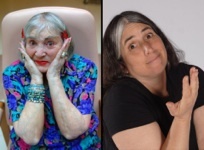 In October 2002, a forty year old comedian and comedy producer named Lisa Geduldig met eighty seven year old, Esther Weintraub, a resident of a Jewish nursing home in San Francisco, and the two embarked on a lifelong friendship. Esther was a former model and stand up comedian; a professional violinist in a Jewish mandolin orchestra in Canada in her teens; she was socially and politically minded, a fan of gay culture, a grandmother, a breast cancer survivor, not one to mince words, and so much more. Esther was far from being a conventional octogenarian, and their friendship was far from traditional. In some ways, it was like looking in a mirror. “Esther & Me” is their story. The 33-minute film, “Esther & Me,” is being submitted to Jewish, documentary, women’s, and LGBT film festivals worldwide. “Esther & Me” was completed in 2010 and has so far been screened at the following 12 film festivals worldwide. World Premiere: The Jewish Film Fest Berlin: April 29, 2010. US Premiere: The Rhode Island International Film Fest: Aug 14 & 15. Southwest Premiere: Austin G&L Int’l Film Fest: Sept 10. Arkansas: Hot Springs Doc Film Festival. Oct 16 & 24, 2010. Canadian Premiere: St. John’s Int’l Women’s Film Festival. Oct 28, 2010. SF Int’l Women’s Film Festival. April 10, 2011 @ 3pm. Roxie Theater. Copenhagen Jewish Film Festival May 20-23, 2012. DVDs now on-sale! Click here. Jewish Penicillin/Island on a Hill. Courtesy: Jewish Home & Songwriting Works.